Apple Pie Oatmeal Breakfast Recipe Kids LOVE! Apple Pie Oatmeal is the ultimate healthy breakfast comfort food… it tastes just like warm apple pie! This apple pie oatmeal breakfast recipe is easy to make and fun for kids to put what they want in their bowls. Try this family favorite oatmeal recipe today! Make some oatmeal and turn it into individual oatmeal apple pies. Kids love making their own apple pie oatmeal! 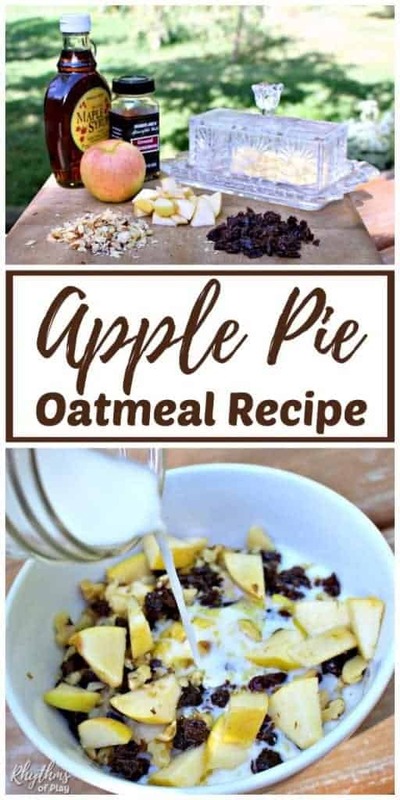 Cook up some oatmeal and prepare a few bowls of goodies to sprinkle on top so everyone can make their apple pie oatmeal just the way they like it. Children love to put what they want into their warm oatmeal apple pies! All measurements are approximate – Make apple pie oatmeal to suit your taste. You will need approximately 1/2 cup of oatmeal per person. Make as much oatmeal that you need to feed the size of your army. As mentioned above, you will need approximately 1/2 cup of oatmeal per person. We like to use Old-Fashioned Quaker Oats because they are quick and easy, but feel free to use your favorite brand. If you use another type of oatmeal, make sure you check the cooking directions because they will more than likely be different than the directions that we have provided below. Use a 2:1 ratio of water to oatmeal. In other words, if you use 2 cups water you will need 1 cup oatmeal if you use 1 cup water and you will need 1/2 cup oatmeal, if you use 3 cups water you will need 1 1/2 cups of oatmeal… you get the idea. Bring water with a dash of salt to a boil on a stovetop. Slowly add oats and stir. Turn down to med-low and cook for 5 minutes uncovered, stirring occasionally. Allow the oatmeal to sit for 1 minute before serving. Cover after 1 minute to keep warm. We like to cook our oatmeal in an enameled cast iron pot to keep it nice and warm once we take it off the stovetop. While the oatmeal is cooking, prepare the rest of the ingredients and leave them on the cutting board or place them in small shatter resistant bowls . My daughter likes her milk served to her in her own 8 oz canning jar both to add to her oatmeal and drink with her breakfast. We think they make the perfect glasses for little hands. In our house, we place the butter dish , the cinnamon, and a jug of maple syrup on the table. Then we chop up the apples, walnuts, and raisins and leave them on a cutting board or place them into small bows so everyone can add as much as they like to their apple pie oatmeal. By the way… we love these little shatter resistant bowls for everything! They are the perfect bowls for small children, snacks, dessert, and arts and crafts! We have 10 of them and it still isn’t enough! Most kids prefer and love to feel in charge of what goes into their bowls. They have so much fun making their own apple pie oatmeals and you won’t hear any whining about walnuts or raisins in their bowls if they don’t want them. Of course, you can skip this step and make each one yourself if you prefer. We like to put the butter in first followed by the maple syrup or brown sugar. Next, we add the walnuts, raisins, and apples. Then I pour in some milk and sprinkle cinnamon on top – yum! 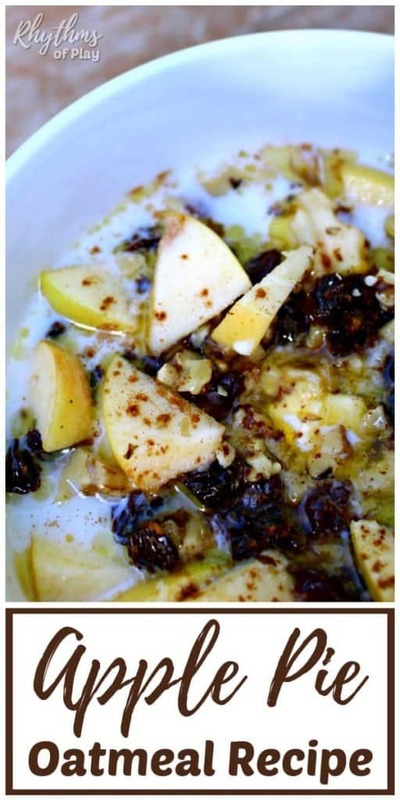 Apple Pie Oatmeal Recipe Children LOVE! Apple Pie Oatmeal is the ultimate healthy breakfast comfort food. It’s both easy to make and fun for kids to put what they want in their bowls. Enjoy a bowl of apple pie oatmeal today… it tastes just like warm apple pie! Another healthy kid-friendly breakfast option is a nutrition-packed green smoothie. Learn how to make the BEST tasting green smoothie ever! It’s so good, that even your kids will beg for more! Don’t forget to check out our apple orchard field trip ideas. Kids love going on an adventure to pick apples and them come home to make apple pie oatmeal or apple crisp. You may also like to help the kids sew a button apple tree. Children can learn how to sew a button and make a beautiful gift at the same time! How to Make the BEST tasting Green Smoothie Ever!